Central Plaza is a pivotal location on the popular pedestrian route between Ireland's top two shopping districts, Grafton Street and Henry Street. Located on the processional route between Trinity College and Dublin Castle, this is one of Dublin's best known town square environments, redefined for a modern generation. Spanning a city block and home to offices, stores and restaurants a cluster of five upgraded building lead onto a dual-level square to create a new destination for Dublin. Central Plaza is set to integrate seamlessly with the newly pedestrianised College Green Plaza to become the place to meet, mingle, shop and dine. 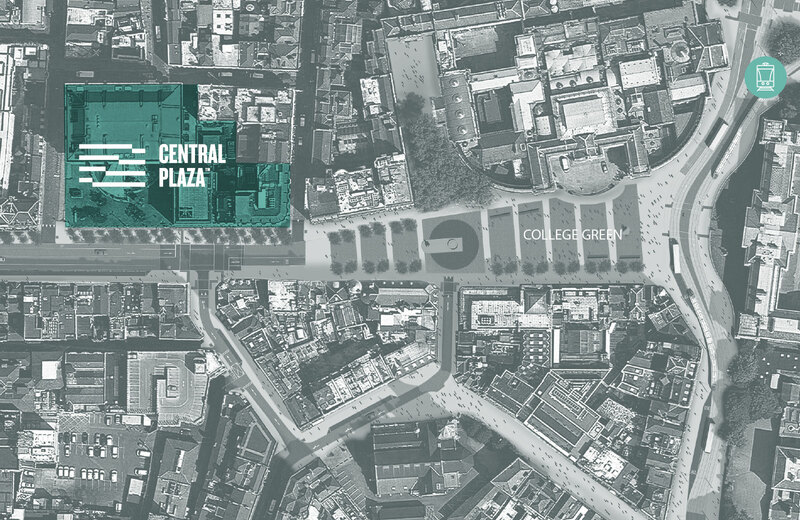 Flanked by Trinity College, Grafton Street and the original Irish Parliament building, the extended plaza will form the ultimate retail rest stop and office breakout space. Central Plaza is easily reached from all corners of the city. Dublin Bus and Dublinbikes bring you right here. Car drivers can avail of hundreds of secure parking spaces within a 5-minute radius. Luas users can take a Cross City tram to the nearby Trinity stop. For those with a longer commute, an 8-minute walk to Tara Station connects you with metropolitan and intercity trains. Crossing the city on foot? Central Plaza is the perfect place for a spot of lunch, coffee or shopping. Central Plaza is at the heart of the living city and ringed with every imaginable type of amenity. The surrounding area is criss-crossed by a network of picturesque, pedestrian-friendly shopping streets that have something for everyone. This is an epicentre of Dublin's legendary nightlife, brimful of great bars and restaurants and cool venues for gigs, movies, exhibitions and theatre shows.